The advancements in pharmaceutical technology and the number of continuously growing health organizations have led to an increased need for skilled pharmacy techs. 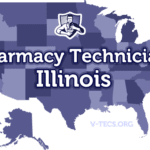 Pharmacy Tech certification implies that an individual has passed the certification test administered by the PTCB and has the necessary knowledge and skills to start working as a professional. In the U.S, the certification requirements differ from one state to another. Even though some states do not require certification, the employers would. In order to start working in a state, individuals need to register with the respective pharmacy boards and obtain a license. The requirements of a license are different from those of certification. The following sections deal with the significance of a pharmacy tech license, its requirements and how to get one. Before moving on to get a pharmacy tech license, it is recommended to take the preliminary steps mentioned below. 1. An individual needs to make sure that he/she has completed a high school diploma or GED, as it needs to be submitted along with the application. 2. While going for pharmacy tech certification, make sure that the institution or college is accredited by the board, to establish credibility. 3. A clean criminal record could be mandatory. 4. Keep all the required documents such as birth certificate, diplomas, etc. ready prior to submission of application. The Bureau of Labor and Statistics in the U.S has reported positive prospects for the future of this field. It is expected that in the next 10 years, the need for pharmacy techs is likely to rise by 33%. The license helps certified individuals provide respected credentials and shows a potential for career growth and higher salaries. One has to be extremely cautious about the local requirements of the state, as PTCE and ExCPT may suffice for some states, yet others may have additional requirements such as completion of an associate bachelor’s degree. If you have gone to a school in your state, the school might also provide considerable help in getting the license. It may also be mandatory to work under the supervision of a licensed pharmacist as part of an internship, before applying for the pharmacy tech license. 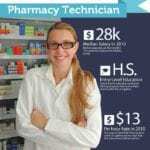 As a certified pharmacy technician, it is expected that the candidate would possess the following skills. 1. Awareness of pharmaceutical and medical terminologies. 2. Able to perform scientific and math based calculations. 3. Know about compounding, packaging, labeling and storage. 5. Maintaining inventory control systems. 6. Administration and Management of a Pharmacy. The industry of healthcare carries great risks. Even a minor involuntary mistake by the pharmacy can result in serious consequences and health risks to patients and consumers. Such events could even turn into ugly lawsuits. To avoid this, the government of U.S ensures that each practitioner has the necessary skills and aptitude to take up the job. The job requires undivided attention to details which is why a license is issued only to the most responsible candidates. Understanding the surge in the demand of Pharmacy Techs, a number of institutions across the U.S have initiated programs dedicated to this field. Depending on the institution, the program could go on from 6 months to 2 years. The curriculum of most schools is designed to be finished within a year. During this time, students are provided the skills mentioned above with the use of text books, lectures and lab experiences. Wherever lab simulations are not possible, students are required to enroll in internships and externships at retail pharmacies to acquire the necessary experience. The tuition fee of these schools could range from $3,500 – $17,000. This is a much cheaper profession to get into compared to other bachelor programs as not only does it take less time for completion, it also demands less finances. Financial aid programs are available for candidates who cannot afford to finance their own education. It is best to start a program at an institution that is accredited by at least the local pharmacy board. These programs not only provide the technical knowledge and experience required for a practitioner but also prepare the candidate for the nationally accredited exams such as CPhT and PTCE. These exams are administered by either PTCB or NHA and establish the candidate’s credibility to be employed as a Pharmacy Tech. While the law regarding acquiring a pharmacy tech license is different from one state to another, the basic requirements of each state remain more or less the same. To avoid any complexity, the requirements of each state are not provided herein, instead, sample information is given below for the states of Oregon and Texas. Enthusiasts can search for the requirements of other states over the internet, but the basic structure would be the same. 1. The form needs to be completed. 2. 1 Passport sized photo has to be attached with the form. 3. A copy of both sides of a government issued photo ID is necessary. 4. A background check fee of $52 has to be paid. 5. An application processing fee of $50 needs be paid. 6. A copy of an attested certificate from PTCB or NHA is a must. Printouts of test results would not suffice. In case applicants have not passed these exams, they will not be able to apply for a certified pharmacy technician license. 7. In case of a criminal record, a detailed explanation is required along with a police report and court documents to reveal the conclusion of the case. For the background check, applicants are sent a fingerprint instruction packet which incorporates a fingerprint card and a verification form. These documents are sent to the Oregon State Police after being sent by the applicant and a nationwide background check is conducted by the FBI. The duration of application processing may vary due to any delays in background checks. The results of this check are valid for 15 months and could be used for another year. For fee processing, the Oregon Pharmacy Board does not accept cash or credit cards. Instead, the application fee needs to be paid in the form of a bank draft, money order or a check. These payment mechanisms need to be addressed to the board; otherwise it could result in cancellation of the application. Once paid, the fee is non-refundable and applicants do not hold any rights to claim back their application fee, even after rejection for a license. Any misleading information in the form may lead to the denial of application rights of an individual. The license is only issued to applicants who are over 16 years of age and its validity lasts for a year. Candidates have to reapply for the renewal of the license each year in order to continue practicing as a pharmacy tech. Once all the requirements are complete, the board takes around 7 – 10 days to issue a license and in no way will the process be expedited. The license is issued using the name on the first application and in case of name change; legal documentation has to be submitted along with other documents. The licensees are expected to keep the board updated at all times regarding their mail addresses. The application may either be filled for a pharmacy tech license or a certified pharmacy tech license. In case of the latter, a certificate from PTCB or NHA is mandatory as mentioned above. Applicants are required to fill the following information. 1. Their name, address, contact and national identification numbers. 2. Previous employment history along with the employer’s contact details. 3. Information regarding any previous pharmacy tech licenses that the candidate might have held. This option is mostly used for renewal of licenses. 4. Personal history including education and other details. Additionally, there is a questionnaire that needs to be filled. It can be regarded as a behavioral assessment as the questions are related to health, use of drugs, humbleness, criminal record, addictions, etc. In the end, applicants are required to read a statement and sign below it to conclude the application. Unlike Oregon, the state of Texas requires 60 days for processing the application to its completion. 1. A fee of $80 is to be paid to the Board of Pharmacy. The payment needs to be made through a check or a money order. 2. The form must be completely filled. Otherwise, applicants are sent a deficiency letter. 3. A passport size photo is to be submitted. This should be a recent photo and should be taken within 60 days before submitting the application. 4. A proof of high school graduation is mandatory. High school transcripts, certificate of proficiency, foreign secondary school diploma and GED test results are all acceptable. Attested copies of any of these certificates are to be submitted with the license application. 5. An affidavit of completed pharmacy technician coursework or a certified copy of the original Pharmacy Tech certificate is required. 6. For practitioners, a self query report from the National Practitioner Data Bank Healthcare Integrity and Protection Data Bank (NPDB – HIPDB) is mandatory. 7. Two copies of fingerprint scans are required. For residents of California, a Live scan is required while for residents of all other states, fingerprint cards along with a processing fee of $51 need to be sent. The application form that needs to be filled is almost the same as the form for Oregon. To avoid any complexities, its details are not provided herein. However, an additional form, such as an Affidavit of Completed Coursework or Graduation for Pharmacy Technician, needs to be filed, which includes the following. 1. The completion date of Pharmacy Tech training program from a school or college accredited by American Society of Health-System Pharmacists. 2. The completion date of 240 hours of Pharmacy Tech education. 3. The completion date of an Associate Degree in Pharmacy Tech. 4. The completion date for a Bachelor of Science or PharmD degree from a school that is accredited by American Council on Pharmaceutical Education (ACPE). 5. Affix school seal or a business card of the pharmacist that provided training needs to be attached with the Affidavit. Additionally, a form for requesting a fingerprint Live Scan is attached with the application for residents of California. Similar forms exist for other states but there requirements may vary slightly, such as the amount of the processing fee, the number of photos, certification requirements, etc. It is best to keep yourself updated with the state requirements as these might change any day. Once the application has been processed and the applicant has received their license, its status can be checked online through the pharmacy board of the respective state. The information on these websites is updated within four to six weeks of a license issuance. Individuals who already have the license but wish to cancel it for any reason are required to submit the cancellation request within 60 days of the license’s expiration. However, once cancelled, the license cannot be renewed and the whole process would start from the beginning to acquire a new license. In case of an unfortunate event where the license is lost or misplaced, a replacement form for reissuing the license needs to be sent to the Pharmacy Board of California. An additional $30 fee is charged for a duplicate license. As mentioned before, the industry of Pharmacy Techs is likely to grow on an accelerated pace in the coming years. This might also give birth to new laws and restrictions. Therefore, the present era is the most suitable time to pursue this career as its education takes much less time than other disciplines and it involves rapid success. For information regarding some of the best pharmacy tech programs in the U.S, refer to the other articles.